According to Panzer Tracts 9-2, the full name of this vehicle is Jagdpanzer IV (7.5-cm PaK 39 L/48) (Sd.Kfz.162) Ausf. F, though Jagdpanzer IV is a common name, another official name is Sturmgeschütz neuer Art mit 7.5 cm PaK L/48 auf Fahrgestell PzKpfw IV, among others. The 75-mm Pak 39 armed Jagdpanzer IV was in production from January to November of 1944 with total of 769 produced, so could be modeled in service in Italy, northwest Europe and in eastern Europe. The intention of this vehicle was to produce an improved replacement for the StuG III and StuG IV. In August of 1944, two new variants armed with a longer 7.5-cm L/70 Pak 42 gun entered production. These long-gunned versions were to some referred to as "Guderian Ente" , or "Guderian’s Duck" due to the way the vehicle rocked, or waddled’ due to being so nose heavy (I understand that the Soviet SU-100 had the same problem). Terminology and spelling of German terms in this review are taken from Jentz's and Doyle's Panzer Tracts Glossary of German Military Terms. Hasegawa’s very nice and accurate box art for kit MT51 shows the Jagdpanzer IV accompanied in an assault or counterattack by two Pz IV Ausf H or Ausf. J tanks. This box art aids as a painting guide: a panzer yellow vehicle with a partial coat of winter whitewash, on ground with a light snow cover. The box art also as an aid in assembly by showing what the thing should look like when complete. Hasegawa kit MT49 may also be used. Left of the gun mantlet in the photo (right of the driver in the vehicle) we see a conical plate rotated to the side. This is a port for an MG 42 operated by the loader, instead of the Kugelblende (ball mount) MG 34 machine gun of vehicles like the Pz IV and Panther, etc. There is no remote-control roof mounted MG 34 as mounted on the StuG III G and the Hetzer. This is my inspiration for this middle or late-production JgdPz IV; a vehicle with modified schuerzen (5-mm thick side skirts for protection against anti-tank rifles and HE shells). The top third of the schuerzen appear to have been bent inward to match the 30–degree slope of the side superstructure armor. There are some distinct long horizontal scrapes on the skirts and on the superstructure's zimmerit like the vehicle drove and scraped through heavy forest or urban buildings, but I do not believe this scraping is responsible for the angled side skirt. The bending of the schuerzen plate appears to me to be too regular to be an accident or not intentional, that is just my assessment. Other details include a short L48 barrel threaded for a muzzle break but not fitted with the muzzle break, there is spare track on the rear plate, and a horizontal cylindrical muffler. Roadwheels are rubber tired with the late war forged hub. The rear idler wheel is the tubular welded type and the sprocket wheel is the late cast type. The superstructure has a zimmerit coating though it appears that the side skirt plates do not. Regarding the vehicle coloring, I see no definite and distinct camouflage pattern such as green and/or brown, the color appears to be just panzer yellow heavily scratched and dirty. There could be a soft edge pattern barely discernible though this could also be dust and mud and shadowing. I may see two vague darker vertical stripes left and right of the vehicle number 331. A Balkenkreuz located below the vehicle number ‘331’. The number is outlined in white with an interior color but we know not the color: red, black, blue? The vehicle looks quite scraped up and dirty but no significant battle damage or penetrations are visible from this side. Seeing that we do not know the appearance of the other four sides I opted to model my interpretation (artist’s license) of a similar JgdPz IV theoretically within the same unit, but vehicle number 233. The Hasegawa kit 31151/MT51 contains about 134 light gray, injection molded styrene plastic parts along with two soft plastic band tracks. No figures, resin parts, or etched brass parts are included. 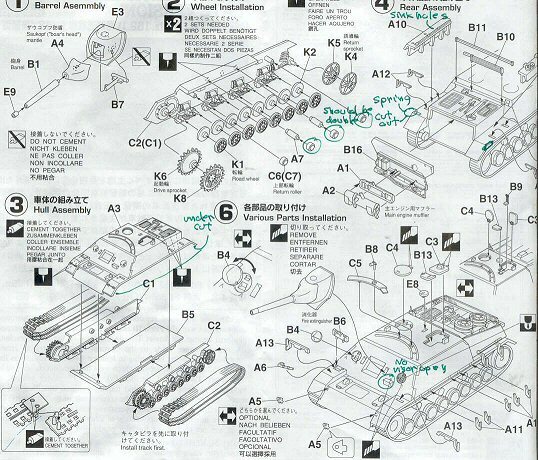 Hasegawa’s instructions are black & white exploded view typical of Hasegawa kits and other kit makers. The instructions are clear and I noted no errors. This version of Hasegawa’s PzJgr IV has four return rollers per side (parts C6, A7 & C7), a later variant has only three return rollers per side. I like that the machine gun ports (parts B4) can be modeled open. Up by Step 4 please note that the rear fender had a cut out on the sides for a spring, see your reference photos for details. This black & white scan of one of Hasegawa’s two sprue-K’s that are included in the kit, but with half of the kit’s wheels (some are already assembled). At far right on the sprue are some extra parts for the Hasegawa Mobelwagen and Wirbelwind kits. Parts are well cast and assemble well. My only grief is with the return rollers, which are one single wheel but should be double, paired wheels like the larger roadwheels. If your kit will have schuerzen then the return rollers won’t be seen so this may be no big deal to you. The good looking late war cast sprocket wheels (K6 & K8) are included. 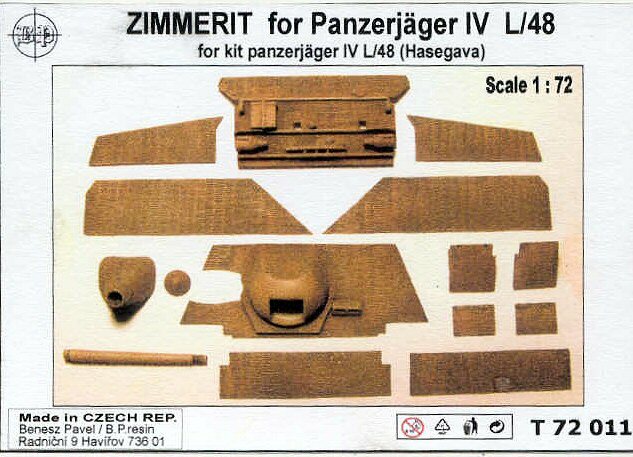 Hasegawa’s Pz IV tracks are the soft band type and are the weakest part of their Panzer IV based kits with very simplified detail. Rather than individual guide teeth (track horns) there is one long ridge running the length. These tracks are the same as in Hasegawa's old Karl w/Munitionspanzer IV within kit #31033/MB 33. I chose to substitute them by CMK’s more accurate soft-plastic band tracks. 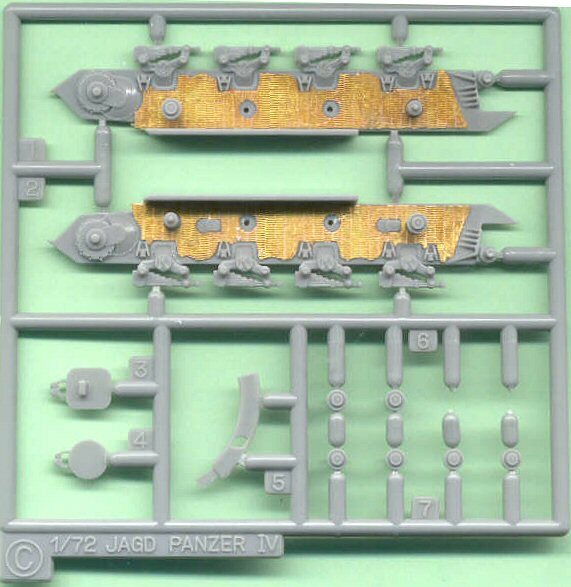 Here is Hasegawa’s Sprue C with the hull sides, crew hatches and steel return rollers for late PzJgr IV and Pz IV models. In the scan we see some Eduard brass zimmerit on the hull sides. At first I was planning to use this zimmerit but, since the Schurzen would hide the zimmerit for this model, I thought it would be a waste to use it and ended up switching the hulls sides with another from a second Hasegawa PzJgr IV kit I have. On this sprue are the all steel return rollers (parts C6 and C7) at lower right. At lower left are the roof hatches parts C3 & C4. The BP Resin zimmerit made for this Hasegawa kit I found to be excellent. It is very thin and applied well with slow curing super glue. It is better than I could do by hand. Etched brass zimmerit’s weakness is that brass cannot be made to go over the curved surface of the mantlet. This set comes with a new resin mantlet with the zimmerit pattern molded in. My only complaint with the BP set is that it has no parts for the upper bow area and the sides of the lower hull. Partially assembled the Hasegawa JgdPz IV showing the BP Resin zimmerit applied along with some Squadron green putty to fill in small gaps. BP Resin also includes a zimmerit coated cast gun mantlet and a resin gun barrel with a threaded end for a muzzle break (unused on this version of the JgdPz IV). Notice the bolt holes on the side of the mantlet; these are missing from the plastic kit's part so should be drilled. The return rollers used (part K3) are the rubber tired type and the idler wheel (parts ) the welded type as seen on the Pz IV Ausf. F and early Ausf. H tank. The front and rear fender parts have been cut off the kit for replacement with resin parts from the BP resin set. Based on the WW2 era photo above the vehicle has eight regular, rubber tired Pz IV roadwheels, no late war steel-tired roadwheels. In order to show wear on the paint I chose to use the ‘salt-technique’ of replicating paint chips. For step-1 of the salt-technique, patches of dark gray were painted on to represent bare metal and red-brown paint to represent primer. At the bottom of the photo is the schurzen for the left side replicated with aluminum sheet of scale thickness. Typically I would use .010 styrene sheet to make 1/72 scale schuerzen but since the top third of the schuerzen had to be bent inward something had to be used to hold the bent shape; aluminum sheet was ideal for this. The schuerzen have been primed with acrylic white primer paint. As far as design and construction of Hasegawa's Jgdpz IV model, I appreciate that all three of the roof hatches can be modeled open, not so with Trumpeter's Jgdpz IV model. Notice how long the curved guard for the periscope gunsight on the roof is; based on the plans in Panzer Tracts 9-2 this is characteristic of the Jgdpz IV with the Pak 39 L48 gun, not the Pz IV/70 with the long gun barrel. Logic would tell me that we cannot therefore use this Hasegawa Jgdpz IV hull with the latter long barreled version. The curved plate over the gunsight opening (part C5) does not exactly match that in my references which shows the guard sitting in between the curved rails. This Jgdpz IV is being painted in just a plane panzer yellow color. The tracks here are the CMK soft plastic band tracks, an improvement over the Hasegawa tracks. An assumption was made that the standard mounting brackets in the kit, visible in the photo above, were used to also mount these altered schuerzen plates. In this photo the schuerzen have been attached and dark gray acrylic painted where I would simulate wear in the black & white period photo above. The roadwheel’s rubber tires (parts K1 & K2) have been painted with Poly S Grimy Black acrylic paint as regular black would be too dark for the scale. To simulate extensive chipping and scraping of the paint I used the salt-technique: the area is wetted with water and salt crystals sprinkled on. When dry we spray the salted area with a light coat of base Dunkelgelb. Salt crystals can be added or brushed off as needed. After the salt has dried, spray on the final coat of paint using low air pressure then let dry. After the paint is dry, flick off the painted salt with a stiff small brush : we then see the chipped paint effect of a well worn AFV. At this point a dark brown wash, made of turpentine and artist’s dark umber oil paint, has been added to bring out detail in the zimmerit coating and other recessed areas. The guard over the gun sight does not match that on my reference photos and scale drawings. The guard rests within the curved rails, not on top of the rails as Hasegawa portrays. Here we have photos of the bow (left) and stern (below) of the completed JgdPz IV model. The Hasegawa water-slide decals have been applied over a coat of gloss acrylic then plenty of Solvi Set applied to get the decal film to nestle down into the recesses of the zimmerit pattern. After the decals are satisfactory, I sprayed on a light coat of acrylic flat coat tinted with 5% to 10% tan paint to tone down the base coat and markings. The Jagdpanzer was given a dusty coating by painting on MIG dry paint pigments with a wet brush; then, after the pigment was dry, the excess was brushed off with a small stiff brush. The display base is part of an old 1/76-scale Matchbox kit. In comparing to the original photograph you see that I opted not to model the long scrapes along the side of the armor skirts, something I regret now. It looks like I forgot the springs to hold down the rear mudguard flaps; I will have to correct that sometime in the future. I found the Hasegawa Jagdpanzer IV kit a solid kit of high quality 1/72-scale molding, which fit together well and with few defects. It does suffer from less detail compared to the newer Dragon JgdPzr IV kits, though is notably better than the old ESCI kit and has some superior features over the Trumpeter Jgdpz IV kit. Hasegawa’s Pz IV tracks are its weakest features. Regarding the aftermarket zimmerit, I definitely prefer the BP Resin over the etched brass since it is easier to work with; both look more convincing than most all the hand done zimmerit coating in 1/72-scale. PANZER TRACTS No. 9-2 Jagdpanzer, by Thomas Jentz and Hillary Doyle. (2012) ( www.panzertracts.com) This is a replacement for the earlier Panzer Tracts No. 9 and covers the Pz IV based Jagdpanzer IV. PANZER TRACTS No. 9 Jagdpanzer 38 to Jagdtiger, by Thomas Jentz and Hillary Doyle. Darlington Productions (1997). This is an old, out-of-print reference publication but still quite adequate. Jagdpanzer IV, Wydawnictwo Militaria 150, 2002) ISBN 83-7219-125-5. Polish publication with English text, color profiles and historical photos.